The ring dance was also present throughout the Middle Ages in the Reigen, or round dance of the peasants, and in the entertainment of the troubadours in the courts1. At this time, there was still a cosmic element associated with the round dance pattern as Honorius states, “In their ring dances they thought of the rotation of the firmament; in the clasping of their hands the union of the elements”2. Maypole dancing or May Day feasts with their ring dancing around a festooned pole or tree is said to have come from this age3. Even into the present age, the same pattern of the round dance persists. The Shakers believe that the circle is an emblem of their perfect union and use dances with movements in concentric circles around a central chorus to show the all-inclusiveness of their gospel6. 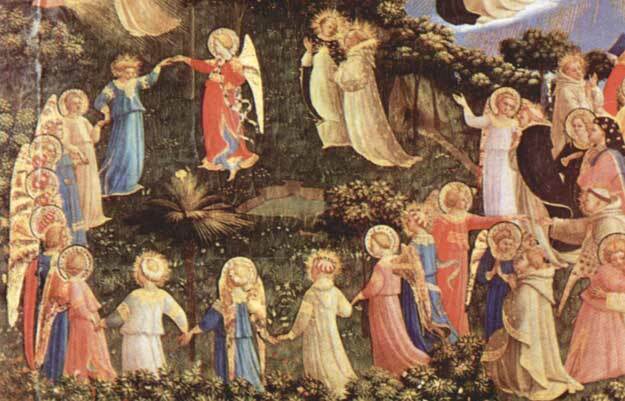 Indeed, their square-order shuffle dance is patterned after a vision of angels dancing around the throne of God7. A German dancer named Bernhard Wosien created what he called the Sacred Dance in 1976, and enthusiasts continue to expand on his theme, calling it the Circle Dance, or Sacred Circle Dance, and including a small altar of flowers or other sacred object in the center of the circle8. Nibley notes that H. Leisegang connects this current marriage practice with ancient prayer circles10. Even modern-day ballroom dancing and social round dancing (often called sequence dancing) owes some recognition to its heritage of ring dancing in the courts of the nobility during the Middle Ages. In some of this social round dancing there is a leader or cuer who calls the steps to be danced in the ring. More examples illustrate this dance pattern exhibited in other areas of the world; however, the preceding is sufficient to show that it has penetrated almost every clime and in every time. More significant is the fact that these round dances all follow the same general prototype of a circular formation of dancers in a circular or rotating motion, often around a central sacred object, person(s) or altar. Generally they are religious in nature, with the participants joining hands with their neighbors, and usually following a central leader in singing, praising, chanting, reciting a text, or following some physical motions or gestures. So where did the round dance come from? Where did the tradition of the round dance, present in all of these civilizations, have its origin? Some scholars have said that it is through borrowings from other civilizations, but this cannot be the ultimate answer since many of the civilizations, even some of those mentioned earlier, were contemporaries and occupied different corners of the globe. How did they all come to have the same pattern in their dance rituals? I believe that it all links back to religion, the gospel of salvation that was taught to Adam and Eve in the beginning, and the rituals and ordinances associated with that gospel. These rituals were slowly corrupted and changed into apostate imitations which have spread across the world. As Ellfeldt notes, the original meaning of the ritual dances and ceremonies were mostly lost, and what we are left with are patterns, gestures, sounds or symbols. However, these tokens still assure the participants propitiation and salvation11. The ritual transforms into art as the faith and symbolism behind it is lost12. This can easily be seen in the metamorphosis of dance as a religious gesture into an act of entertainment in the Greek society13. Interestingly, the resurgence of many references to the ring dance shortly after the crucifixion and during early Christianity, as noted previously, is a strong indicator that Christ may have restored the original form and meaning of these rituals during his earthly ministry. Today, we find the true, restored and presently revealed form of the sacred ordinances of the gospel in the temples of The Church of Jesus Christ of Latter-day Saints14. Interesting paper. Had a teacher at BYU who taught about ring dances and ceremonies (Griggs- the same teacher/archaeologist who is working on the early Christian ceremonial clothing in Egypt you also cited on your site). (The.awesomest.teacher.ever). It was interesting to read a little more history about the dances.